FAT CAT IS OUT OF THE BAG: Evi­dence has now been made pub­lic of ille­gal actions and col­lu­sion between for­mer Cal­i­for­nia Pub­lic Util­i­ties Com­mis­sion pres­i­dent Michael Peev­ey and util­i­ty PG&E, as crim­i­nal inves­ti­ga­tions con­tin­ue. As part of a fed­er­al and state inves­ti­ga­tion into what appears to be sys­temic cor­rup­tion involv­ing for­mer senior exec­u­tives at PG&E and the Cal­i­for­nia Pub­lic Util­i­ties Com­mis­sion, 65,000 emails have been pub­licly released, reveal­ing col­lu­sion and con­spir­a­cy. For­mer com­mis­sion pres­i­dent Michael Peev­ey and for­mer PG&E Vice Pres­i­dent Bri­an Cher­ry are wish­ing inves­ti­ga­tors would have been kept in the dark. The pair pri­vate­ly dis­cussed prob­lems with so-called “smart” meters, vio­lat­ing their own rules of pro­ce­dure while admit­ting to health harm and over­billing prob­lems – which sev­er­al thou­sand Cal­i­for­ni­ans had been warn­ing about since 2010. Details con­tin­ue to sur­face, as press and researchers con­tin­ue to delve into the moun­tain of col­lu­sion. It is per­haps just­ly iron­ic that we now see, made pub­lic, the pri­vate email cor­re­spon­dence of those who have teamed up to deploy tech­nol­o­gy which, accord­ing to a 2012 US Con­gres­sion­al Research report, facil­i­tates unprece­dent­ed in-home sur­veil­lance. 1) Peev­ey knew – since 2010 – that “smart” meters can cause phys­i­cal harm. And he believed PG&E should do some­thing about it, albeit “qui­et­ly”. How­ev­er, instead of reg­u­lat­ing the util­i­ty to ensure pub­lic safe­ty, he deferred his law­ful duty to PG&E – the enti­ty caus­ing the harm. 2) Peev­ey said after a “smart” meter was installed on his vaca­tion home, his bill more than dou­bled. PG&E react­ed imme­di­ate­ly to per­form a “deep dive inves­ti­ga­tion” into the billing sit­u­a­tion at the 3,118-square-foot Sea Ranch home on the North­ern Cal­i­for­nia coast. There have been tens of thou­sands of billing com­plaints in Cal­i­for­nia, reveal­ing a wide­spread, sys­temic over­billing prob­lem which appears to be the case every­where “smart” meters are installed. 3) Peev­ey and Cher­ry col­lud­ed to per­ma­nent­ly delay hear­ings until the “smart” meter roll­out was com­plet­ed. 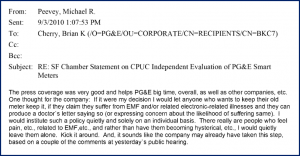 Mike [Peev­ey, the CPUC pres­i­dent] grum­bled about the CCSF PFM [City and Coun­ty of San Fran­cis­co Peti­tion for Mod­i­fi­ca­tion] and the folks in Sebastopool [sic] who want to delay Smart­Meter imple­men­ta­tion. He implied that this wasn’t going to hap­pen and that by the time the Com­mis­sion got around to act­ing on it, we would have installed all of our meters. In fact, not all of the “smart” meters have been installed in Cal­i­for­nia – as thou­sands of cus­tomers have refused and 57 local gov­ern­ments don’t want them – and there are now obvi­ous issues with those that were installed. Thanks to mul­ti-year efforts of advo­cate groups like EMF Safe­ty Net­work and StopS­mart­Meters!, the cat is now out of the bag as to how dan­ger­ous and cor­rupt the grand plans of peo­ple like Michael Peev­ey have been. 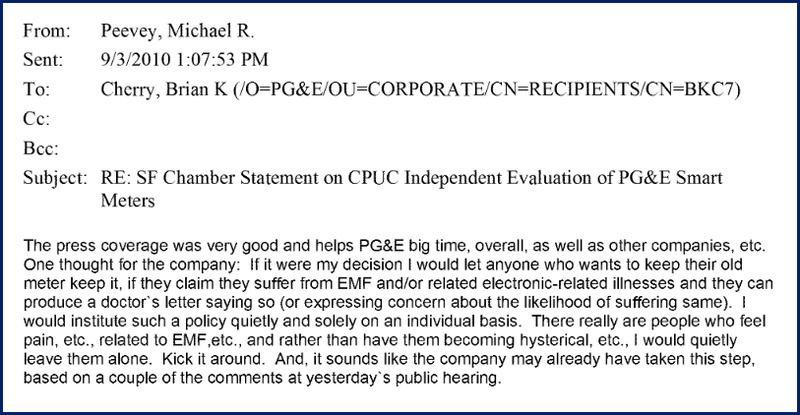 The CPUC and PG&E knew that peo­ple were being harmed and they col­lud­ed to silence the truth. We encour­age you to stay tuned as more rev­e­la­tions come out by the day. With the judge-shop­ping scan­dal, ex-Com­mis­sion­er Peevey’s home com­put­ers, hard dri­ves and smart phones were seized in Jan­u­ary by inves­ti­ga­tors. This has already led to more evi­dence of col­lu­sion in the mul­ti-bil­lion dol­lar bailout of the San Onofre nuclear pow­er plant in 2013. As util­i­ty and polit­i­cal lead­ers from around the coun­try toast­ed Michael Peev­ey last night on a “job well done”, truth advo­cates will con­tin­ue to sift through emails. We can only guess what will be revealed in the com­ing months. How­ev­er, it appears that it won’t be a com­fort­able retire­ment for those who broke their own rules and brushed aside safe­ty in order to push through the mul­ti-bil­lion dol­lar boon­dog­gle that is the wire­less “smart” grid. Josh del Sol is the direc­tor and pro­duc­er of Take Back Your Pow­er, a rev­e­la­to­ry doc­u­men­tary fea­ture film uncov­er­ing the world­wide ‘smart’ meter­ing and grid agen­da. Watch the film and sub­scribe to updates at www.takebackyourpower.net, and fol­low him via twit­ter @TBYPfilm.